New York and the more specifically Tech Valley Region have proven time and again that its talented and productive labor pool of skilled and non-skilled, technical and clerical workers are ready to meet the employment needs of global technology companies. Tech Valley brings together a variety of technology companies that have created a large pool of skilled professionals from Ph.D. researchers to technicians. 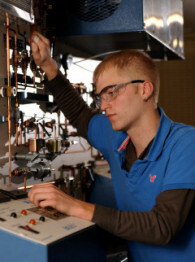 This skilled workforce has extensive experience in engineering, electronics and manufacturing. New York is home to more than 400,000 scientists and engineers, including 8 percent of the nation’s Ph.D.s. These scientists, engineers, designers and equipment technicians will be essential to any high technology manufacturer and related business that chooses the Luther Forest Technology Campus as its new home. The region also offers a variety of skills training programs that can be custom-tailored to meet your specific needs. Delivered through a statewide network of local providers, such as community colleges and vocational-technical schools, New York State’s training programs are both flexible and convenient. Whether you need to train new workers or upgrade or retain your current employees, New York has a program to meet your unique training needs. A truly unique feature of the Campus will be the Training and Education Center for Semiconductor Manufacturing and Alternative and Renewable Energies (TEC-SMART). TEC-SMART will be a state-of-the-art education and training facility that is located adjacent to Luther Forest Technology Campus at the Saratoga Technology + Energy Park. This training facility is a joint initiative between the Hudson Valley Community College and the New York State Energy Research and Development Authority (NYSERDA). TEC-SMART will train technicians and provide customized training programs to suit the needs of the high tech business community. Photo credit: Banner image courtesy of University at Albany's College of Nanoscale Science and Engineering. Image on right: Courtesy of Hudson Valley Community College. Image on Left: Cleanroom image courtesy of University at Albany's College of Nanoscale Science and Engineering.